The Queen, accompanied by The Prince of Wales, traveled to the Palace of Westminster to open the Session of Parliament. As promised, this year's State Opening of Parliament was a "dressed down" version, thanks to the speedy schedule. Business as usual meant that those of us hoping The Queen's jewels might reflect a more special occasion were disappointed - not that one could ever be too terribly disappointed with an 18.8 carat diamond, of course, but she stuck with her usual day pearls and earrings. What was not business as usual: The Prince of Wales stood in for The Duke of Edinburgh. Prince Philip was hospitalized Tuesday night for an infection, according to a Buckingham Palace spokesperson: "The Duke of Edinburgh was admitted to King Edward VII Hospital in London last night, as a precautionary measure, for treatment of an infection arising from a pre-existing condition. Prince Philip is in good spirits and is disappointed to be missing the State Opening of Parliament and Royal Ascot. The Prince of Wales will accompany The Queen to the State Opening. Her Majesty is being kept informed and will attend Royal Ascot as planned this afternoon." And so The Queen carried on, sporting a delphinium blue coat with a blue and yellow floral silk dress and matching hat adorned with flowers by Angela Kelly. An outfit which, many have noted, sorta kinda dresses her up like...the European flag. Because if you're gonna make The Queen schlep down to London on an Ascot day, you're gonna get trolled. 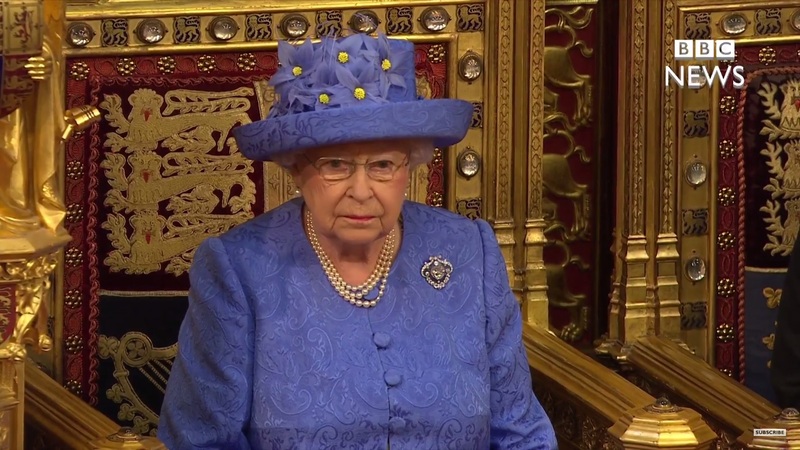 I watched The Queen's Speech on 2x speed, which is exactly how I imagine it went in Her Maj's head. She had to get to Ascot, and she had to make it in time for an outfit and brooch change (people bet on those hats, you know, it just won't do to be tipping them off early! ), so speed.it.up. Recruiting The Duchess of Cornwall to help continue the day's yellow and blue theme, The Queen wore another ensemble designed by Stewart Parvin and Rachel Trevor-Morgan. She swapped in the Flame Lily Brooch for an extra bit of diamond sparkle. The Duchess of Cornwall repeated her outfit from Princess Charlotte's christening as she continued to display her resplendent collection of pearl chokers. The Duchess of Gloucester wasn't slouching on the jewel front either; check out her sneaky use of diamond and ruby clip brooches at the neckline. Elegantly piled on, just how I like it. As always, review of the rest of the family's fashions is still to come over at the other blog, so stay tuned.